If the global commodity price downturn wasn’t enough to compete with, during 2015 Australian junior gold producer Aurelia Metals (ASX:AML) also had to contend with a legal dispute with Glencore. However, since coming through the dark days of mid-2015 Aurelia has two years of breathing space on its debt repayments and has a glistening gold producing project at Hera. Jim Simpson was appointed CEO in August 2016 to tighten up the project, improve the margins and its profit-making ability before interest free period ends in March 2018. Having reached the major milestone of commercial production in the June 2015 quarter, Aurelia has gone on to build a platform which could produce significant growth, production and the rebalancing of the balance sheets. Located around 100km southeast of Cobar, New South Wales, the Hera gold-lead-zinc mine produced around 47,000 oz of gold, 7,600 tonnes of lead and 7,200 of zinc in FY2016 – its first full year of production. Simpson identifies the period between mid-2015 and now as a watershed time for Aurelia. The company amicably settled the legal dispute with Glencore and on the operational side underwent a significant turnaround in the last 18 months. Now Aurelia is financially healthy with AUS$23 million in the bank and the Hera project has improved operationally across the board. In terms of the production Aurelia has worked wonders with the Hera project since June 2015. Simpson cites improvements such as gold recoveries improving from 78% up to 90% and throughput has increased significantly from around 310,000 tonnes per annum (tpa) to 380,000tpa. 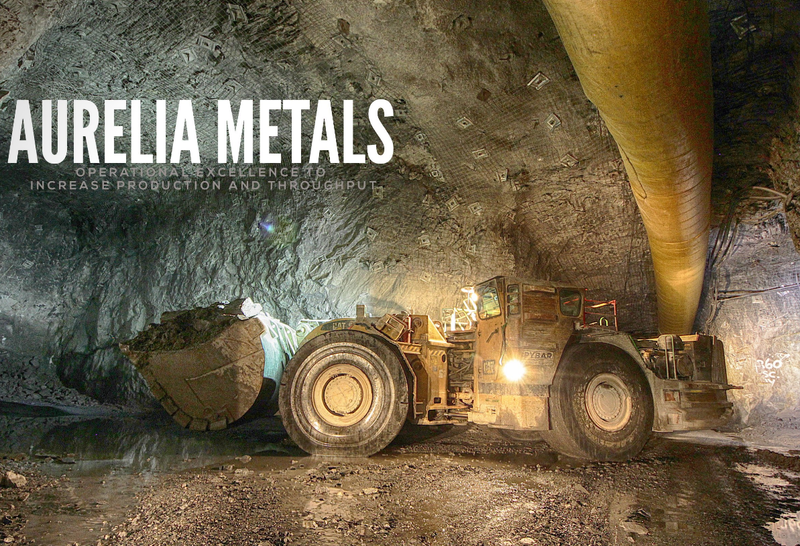 Aurelia has also markedly tightened up its efficiency processes for production, both mining costs and milling costs have reduced by almost a quarter. Finally the Orange-based firm continued to repay debt, approximately $10 million and retains over $20 million in the bank. “2016 was definitely a watershed year and we saw a considerable turnaround from where Hera found itself in 2015,” says Simpson. While Hera has nearly seen quarter on quarter growth since the June quarter 2015, the numbers for October 2016, when converted to a quarterly figure, show step change improvements. Throughput hit nearly 100,000 tonnes compared to a previous best of around 85,000t in Q3 2016. Gold recoveries reached 87%, a rise from 84.3% in Q3. Overall October saw production numbers of around 14,000 oz at just over 5g/t purity. Aurelia has had an exemplary year on the corporate side of the business as well as operations. It registered a maiden profit in FY16 of $10.9 million, including a sales revenue of $91.9 million, the company’s share price has risen from AUS$0.04 to $0.18 since January, substantial cash has been accumulated and installed a new management team to take the company forward. Simpson was brought on board to continue to improve operations at Hera and lead the project into stronger profitable production in the run up the end of the interest free period. He outlines a wide-ranging strategy to achieve this goal. One of the key focus’ for this year, according to Simpson, is to continue to see throughput at the plant rise with the CEO targeting the 400,000tpa barrier in 2017 and then to push beyond that. Another area of Simpson’s attention will be turned towards gold recoveries at Hera, which have already seen significant improvements. “We will continually improve our recoveries. Yes, we have 90% recovery but we would like that to improve again. I think 92% isn’t out of the question but it really depends on further improving the gravity circuit. We will take it one step at a time and will consolidate at 90% which is a good psychological barrier and then try to push on to 92%,” explains Simpson. Reducing costs through the process is also high on the priority list for Simpson. In the first instance the CEO will be looking to secure long term contracts with suppliers and fixed rates and secondly his aim to improve throughput past the 400,000tpa will see the unit cost of production reduced conversely. In addition to improving costs Aurelia is embarking on a light hedging programme so it can secure favourable gold prices for prolonged periods. The Hera deposit also has grounds for further exploration at deeper levels. Simpson and the team will be looking to increase the mine life through expansion into the North Pod and deeper targets. Another potential fruitful area for exploration is Aurelia’s Nymagee deposit. Nymagee is a copper deposit situated about 4.5km from the Hera deposit and Simpson is hopeful that it will prove to be a valuable addition to the overall project. “We will be looking at potentially developing an ore reserve from the existing resource. We are looking at a high grade underground ore reserve that would become part of our life of mine plan. “At this stage the Nymagee deposit will follow the Hera deposit. We have yet to determine the value of Nymagee but at this point we would be looking at 3-4 years of mine life extension with Nymagee following Hera. Simpson stresses that the improvements made at the mine and plant to put the project in the position it is now would not have been possible without the contribution of its major partners in the supply chain. Pybar Mining Services are contracted for full serviced underground mining, HMR Drilling are responsible for all drilling and exploration, Millbrae Crushing supply the crushed product to the mill and local earth moving company Nickelsons have all been integral to the journey so far. Overall Aurelia has laid the foundations and put the building blocks in place to develop a significantly profitable, self-sustaining project. Simpson will continue to build a cash base to pay off a substantial chunk of debt in 2017 and early 2018 and then push on with an extended mine life to realise stakeholder value in the years ahead.